Today left Melbourne bound for Bangkok, via Singapore. Flight was chock-a-block in economy, and check in was very busy... I used the internet check in queue which was shorter than the business/first class queues. I was hoping for that elusive upgrade, but alas, it was not going to happen today. Collected my boarding passes for 60H and 60K (preselected online), the 2nd last row, with a two-some on the right hand side. Nice when travelling as a pair in the 777. 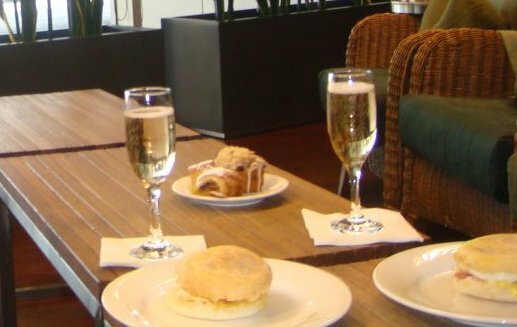 There is always that tiny tiny hope when your checking in for an economy flight that you will be upgraded, but with those hopes dashed, I thought I will try to make the most of it and have some sparkling wine and a bacon and egg muffin, and some nice cakes, in the Air New Zealand lounge. I was welcomed into the ANZ lounge by the staff, no mention made that I SHOULD be in the Singapore lounge, I was told I was welcome in either, along with my guest. What a wise move, as the ANZ flight to Auckland was just pushing back we had the whole place to ourselves. I popped into the Silverkris lounge after breakfast for a few minutes just to see the comparison, and there is no comparison, SKL Melbourne is a disgrace. Food is poor, poor drink selection, too many people, looks old and rundown. Not a good look for a '5 star airline'. Only helpful thing was the boarding call, which was called towards the end of the boarding for the rest of the pax, meaning we all walked straight on and nearly everyone else was seated. Captain mentions some rough weather ahead of us for the first 90 minutes of the flight. This is not unusual in southern Australia - with some very high upper winds common. Flight time was looking at 7 hours 15 minutes today. soon after takeoff from Melbourne - nice green farmlands! Drinks were offered soon after takeoff, I had my customary singapore sling, but it seems my flight attendant didn't give swizzle sticks with his mixed drinks.... tsk tsk! WHAT AM I GOING TO SWIZZLE WITH, my finger?! outrageous! Soon after the drinks service we encountered some moderate turbulence, seatbelt sign went on. We were flying at 30,000 feet and encountering headwinds of around 220km/hour. We were in some high level cloud so couldn't see anything much outside. The turbulence became quite rough at times and the crew had to take their seats and the lunch service was delayed. I was still full from breakfast so that was fine by me. wow, this is going to be a long flight! Look at the ground speed! and this is how it looked! The meal was pretty good actually, I went for a Tiger beer to accompany it. Tuna salad was quite nice, as was the chicken. The lemon layered cake came in a plastic packet but it actually tasted very good! And it seems we have a new cheese in economy out of Melbourne, it came in a little paper wrapped block, which was easy to get into, unlike the previous plastic packets they used to come in! I was offered a second drink prior to the end of the meal service. Soon after the second meal service was cleared the captain announced our arrival information. There was a few showers around in Singapore and it was 29 degrees. We would be arriving a few minutes later than scheduled. There was an announcement soon after the descent commenced that the crew would be seated earlier than usual due to bad weather in Singapore. However, our flight remained smooth with the flight crew maneuvering left and right around the various storm cells that surrounded Singapore this afternoon. 9V-SYG parked at the gate in T2, Changi Airport. Thanks for getting me there safely! Wow... You did a fantastic job. All of your pictures are very good. I can fell the journey by your pictures.